KBSS Engineering can swiftly mobilise experienced personnel and high quality equipment to provide large scale circular and X-Y milling solutions on your project. Our skilled team performs machining of a wide range of industrial equipment and has the capacity to complete milling on complex shapes and materials as required. Our common milling projects include mining and oil & gas, during the construction stage of the project. 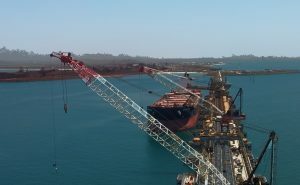 KBSS Engineering was contracted to assist in the construction of a new port facility for the Cape Lambert Wharf project. Part of our work included providing specialist on-site machining services including large scale circular and X-Y milling of major project components. Access a skilled workforce and an unlimited supply of equipment to service your projects needs.